Fig. 13-13. Typical Satellite-Antenna Requirements for Telemetry and Command Coverage. The satellite Is spin-stabilized during transfer orbit, and 3-axis stabilized In geostationary orbit [Lo and Lee, 19%]. 18 deg. A simple hom antenna is often used at frequencies of 4 GHz or above (such as the Intelsat V C-Band TT&C antenna). When the frequency is below about 2 GHz, the helix often has lighter mass and is easier to mount on a satellite structure. Either a single helix (FLTSATCOM UHF transmit), or quad-helix (Intelsat V L-Band) may be used. Table 13-14 compares these choices for an Earth-coverage antenna at 400 MHz. Wider satellite antenna beamwidths are required during launch and insertion into orbit because satellite maneuvers cause large variations in angle toward the ground station. During transfer orbit the satellite is often spin-stabilized, thus requiring a toroidal beam (omnidirectional in the plane perpendicular to the satellite spin axis) to provide continuous coverage. Figure 13-13 shows a typical antenna pattern. A biconical horn can generate this beam if it is mounted on a mast to avoid reflections from the satellite's body. The antenna gain is typically at least -3 dB ±35 deg from the spin axis. Once in orbit the satellite is stabilized toward Earth. 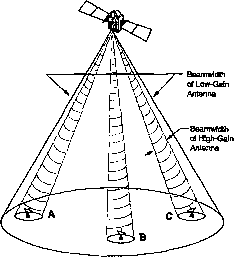 A directional antenna, usually a simple conical horn, provides a gain of 9 dB or more over ±20 deg from the Earth vertical. As an example, the Intelsat V satellite combines the toroidal and directional (Earth-coverage) beams at a single port connected to the command receiver. The telemetry transmitters switch to either beam, depending on the mission phase. High-gain antennas are required to support high data rates with low transmitter power. The basic antenna types used for this application, summarized in Table 13-15, are the reflector, lens, and phased array. The reflector is most desirable for satellites because of its low mass, low complexity and cost, and design maturity. The weight advantage of a reflector over a lens or phased array is especially significant for larger antenna diameters (> 0.5 m). Offset feeds can also simplify the satellite structure. The satellite structure contains the feed which is pointed at the reflector (Intelsat V, for example). Furthermore, an offset feed minimizes aperture blockage and therefore reduces the sidelobe levels. In some missions it is necessary to change the direction the antenna beam is pointing. Steering the beam electronically is often preferred to mechanical methods, especially if the beam direction must be changed rapidly. 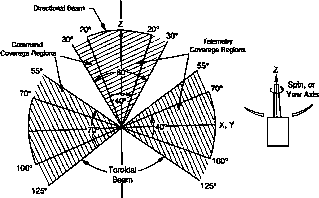 The beam of a reflector antenna can be steered by switching to an off-axis feed. However, conventional reflector antennas have high losses when scanned off axis. A shaped secondary reflector can compensate for these losses, but scan angles greater than about 10 deg are difficult to achieve. We can design lens antennas for good scanning performance, but their mass is generally larger than the reflector plus feed when the diameter exceeds about 0.5 m. The lens or reflector antenna can perform beam scanning by switching between multiple feed elements or by using a phased array as the feed. Switching between feed elements or varying the amplitude or phase of each element electronically controls the feed. However, losses caused by the feed control (beam forming) network [£/ in Eq. (13-4)] can degrade the scanning antenna's performance. A phased-array antenna may generate one or more teams simultaneously, forming these beams by varying the phase or amplitude of each radiating element of the array. This technique used for microwave radiometry is described in Chap. 9. We may also use an adaptive array to automatically point a null toward a jamming signal source to reduce the jamming-to-signal ratio. TABLE 13-15. Six Antenna Configurations Used in Satellite Systems. These antennas are suitable for beamwidths less than 20deg, producing gains above 15 dB. • Aperture blockage raises sldelobe level. • Long transmission line from feed reduces efficiency. • Short, low-loss transmission line. (Increases gain by -1.5 dB). • Same as Center-fed Parabolic Reflector except low aperture blockage reduces sldelobe level and increases efficiency. • Convenient for satellite mounting with feed embedded Inside satellite. • Low aperture blockage reduces sldelobe. • Limited scan angle = 10°. • Good aperture efficiency (no blockage). • Mismatch at lens surface causes losses. • Heavy, especially low-frequency applications (used at frequencies above 15 GHz with diameters below 0.5m).
. Multiple Independently steerable beams. . High reliability (distributed active components). • Higher losses In feed distribution system. • High EIRP obtained from many small transmitters (space combining). switched-feed array. These antennas generate either simultaneous multiple beams or a single beam which is scanned or hopped over the Earth's surface using time multiplexing between channels (see Sec. 13.5). Thus high antenna gain and broad area coverage are achieved at the same time. Another advantage of the beamhopping technique is that the satellite coverage can be readily matched to the geographic traffic distribution by making the beam dwell time proportional to the traffic level. LEO satellites such as Iridium and Globalstar form multiple beams using phased arrays covering the visible Earth. The multiple beams provide for spectrum conservation by frequency reuse. Iridium forms 64 beams which scan to continuously point to a point on the Earth as the satellite passes over that point Globalstar has fixed beams which "sweep" over a point on the ground as the satellite passes over. Flg. 13-14. Multlbeam Coverage. To transmit simultaneously to A, B, and C, a multibeam antenna or a beamhopping antenna, with time-division multiplexing, will support higher data rates with lower transmitter power compared to a single, lower gain, broad-beam antenna system. 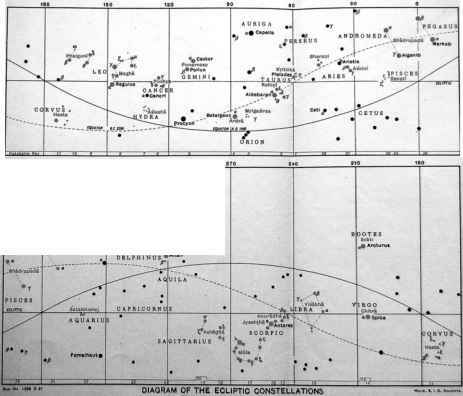 TABLE 13-16. Size and Mass of Typical Spacecraft Antennas. Antennas with shaped or multiple beams include the mass of complex feed systems. Lower gain values are at edge of coverage.